Alien Spaceship Button Badge on a dark blue background with super cute yellow stars. 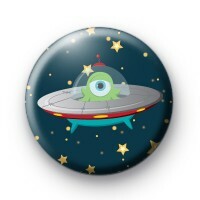 This alien spaceship illustration badge features a super cute one-eyed alien flying a cartoon style flying saucer. We have a great range of space inspired badges including loads of similar space characters so be sure to have a search or check out the categories on the left. 25mm badge handmade in the UK.